The proportion of non-Hispanic white children in the U.S. has declined from 61 percent of all children in 2000 to 51 percent in 2016. In contrast, the proportion of children with Hispanic origins has grown from 17 percent in 2000 to 25 percent in 2016. The percentage of the child population that is non-Hispanic black has stayed relatively constant since 1980, at 14 to 15 percent. From 1980 to 1999, the proportion of non-Hispanic white children in the U.S. population fell from 74 to 63 percent. From 2000 to 2010, the percentage of children who were non-Hispanic white only (following the classification system first used in the 2000 decennial census, in which respondents were given the option of identifying multiple race categories) declined from 61 to 54 percent. This proportion continued to decrease through 2016, reaching 51 percent, and is projected to fall slightly further by 2020, to 50 percent. The percentage of the child population that is non-Hispanic black has stayed relatively constant since 1980, at about 15 percent; this figure is expected to decline only slightly further by 2020, to 14 percent (Appendix 1). 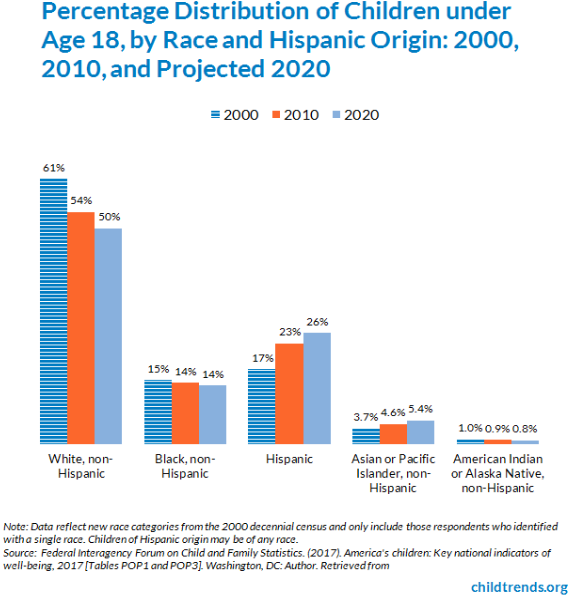 The proportion of children who are ethnically Hispanic has grown steadily, from 9 percent in 1980 to 25 percent in 2016, and is projected to reach 26 percent in 2020 (Appendix 1). However, because of changes in the categories for race/ethnicity used by the Census Bureau, estimates for 2000 and later years are not directly comparable with earlier estimates. In 2010, 68 percent of Hispanic children were of Mexican origin, which was 16 percent of the total child population. Nine percent of Hispanic children in the United States were of Puerto Rican origin, 6 percent were of Central American origin (mainly Salvadoran, at 2.5 percent, and Guatemalan, at 1.6 percent), and 4 percent were of South American origin (the largest group being Colombian, at 1.2 percent). Other large Hispanic groups include children of Dominican and Cuban origin (each accounting for 2 percent of Hispanic children) (Appendix 3). The proportion of non-Hispanic Asian and Pacific Islander children has grown steadily over the past few decades, from 2.0 percent of the child population in 1980 to 5.1 percent in 2016; however, estimates before and after 2000 are not directly comparable (Appendix 1). Among children who are Asian alone, the largest origin groups in 2010 were Asian Indian (21 percent of Asian children), Chinese (20 percent), Filipino (15 percent), Vietnamese (12 percent), and Korean (9 percent). About 6 percent of children who were Asian alone were of mixed ancestry (Appendix 3). The percentage of the U.S. child population that is non-Hispanic American Indian or Alaska Native remained relatively constant from 1980 to 2016, at around 1 percent (Appendix 1). In 2016, non-Hispanic children of more than one race constituted roughly 4.2 percent of the total U.S. child population, an increase of 2 percentage points from the 2000 census (Appendix 1). Among all children identified as being of more than one race (including Hispanic children), the majority (4.4 percent of all children) were white combined with one other race, with 1.7 percent identified as white and black, 1.1 percent identified as white and Asian, and 0.6 percent as white and American Indian or Alaska Native (Appendix 2). State-level child population estimates by race and Hispanic origin from 2000 through 2016 are available at http://datacenter.kidscount.org/data/tables/103-child-population-by-race?loc=1&loct=2. Estimates from the American Community Survey are available for states, counties, congressional districts, metropolitan areas, cities, and census tracts at http://factfinder2.census.gov/. • Data for 1980-2016 and projections: Federal Interagency Forum on Child and Family Statistics. (2017). America’s children: Key national indicators of well-being, 2017 [Tables POP1 and POP3]. Washington, DC: Author. Retrieved from http://www.childstats.gov/americaschildren/tables.asp. • Data on multiple races and ethnicities: U.S. Census Bureau. (2011). 2000 & 2010 Census Summary File 2 [Table QT-P1]. Retrieved from https://factfinder.census.gov/faces/nav/jsf/pages/index.xhtml. All estimates in Appendix 1 are from the Census Bureau’s Population Projections and Estimates Branch, based on models that draw on many data sources. All estimates in Appendices 2 and 3 are from the 2000 and 2010 Decennial Censuses. Child Trends. (2018). Racial and Ethnic Composition of the Child Population. Retrieved from https://www.childtrends.org/indicators/racial-and-ethnic-composition-of-the-child-population.